A genuine OEM FreshFlow produce preserver replacement W10346771A for Whirlpool, KitchenAid, Maytag, Amana, Jenn-Air, and Kenmore refrigerators. Absorbs ethylene, allowing the ripening process of many produce items to slow down. Packet contains two pouches which will be put in the housing in your crisper drawer. Packet also contains a status indicator to help you remember to change the pouches. 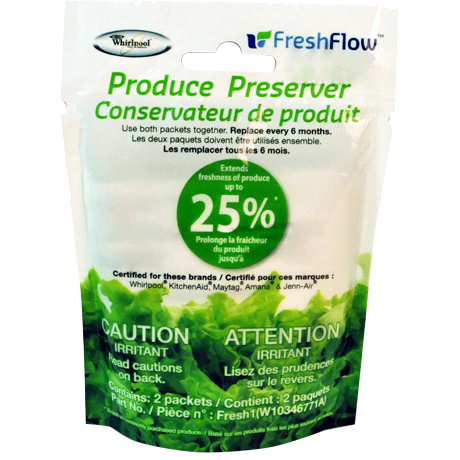 Replace pouches and status indicator every six months for optimal freshness.